The autumn has well and truly arrived as the good weather during the month of September recedes into memory. It has been a record breaking month for dry weather here with only 5% of the expected monthly rainfall. It has been a year of contrasts with the weather changing from month to month. August was cold and wet and May started in a disappointing fashion. Dreary grey leaden skies and heavy showers greeted the Grande Partenza of the Giro d'Italia here in Northern Ireland from 9-11 May. Despite the disappointing weather the local support and enthusiasm for the start of one of three major European cycle races was something to witness. The local cycling fraternity sported special 'Giro' pink race jerseys. Pink bicycles appeared outside shops and local business premises, some councils like Newtownabbey near Belfast, repainted public art pink in honour of the race. The three days the race was in Northern Ireland was something of a cycling festival and the live TV coverage of the stages on the local TV network was every bit as special. I got to see something of the 196km Saturday 10th May 'Causeway Coastal Route' stage as it drew near to Belfast for the stage finish. I waited to see the result of the 4th category climb at 'the Bla'hole' between Whitehead and Eden on the live TV feed before making my way to the Shore Road. Despite the weather, the crowds packed the roadside of the route, a greater proportion sporting pink of the 'Maglia Rosa'. Patience and good humour was much in evidence with small children being perched on adult's shoulders to get a better view of the race. The tension began to build as the group of police motorcycle outriders appeared ahead of the race lead car. A short delay before the riders appeared and the excited shout of 'Here they come' as the lead group ahead of the peloton came into view and quickly flashed by. Anticipation built as the crowd strained to see the whereabouts of the chasing peloton, then the advancing bunch hove into view, intent on chasing down the breakaway. They were by in an instant with a flash of muted colour, rider's begrimed faces grim with determination and effort. The team cars and broom wagon quickly followed before the police started marshalling the crowd off the road to re-open it to normal traffic. Being swept along with the crowd, it took around 15 minutes to get back to where I was staying, just in time to see the close of the stage. The race leaders had got to Fortwilliam Park on the Shore Road. The route then turned right, up North Queen Street, Upper Library Street, Millfield to Belfast Tech College before turning left to finish in front of Belfast City Hall. The sprint finish was won by the German rider Marcel Kittel riding in his first Giro d'Italia, who would also feature later in the Tour de France. The weather was a little kinder the following day for stage three from Armagh to Dublin and the crowds were in no way diminished once the race route crossed into the Irish Republic. So what effect has the appearance of a major European 'tour' had in this part of the world? It has been interesting to see how many local businesses used the appearance of the race in their marketing, one bakery running a competition to win a carbon race bike with special packs of bread. 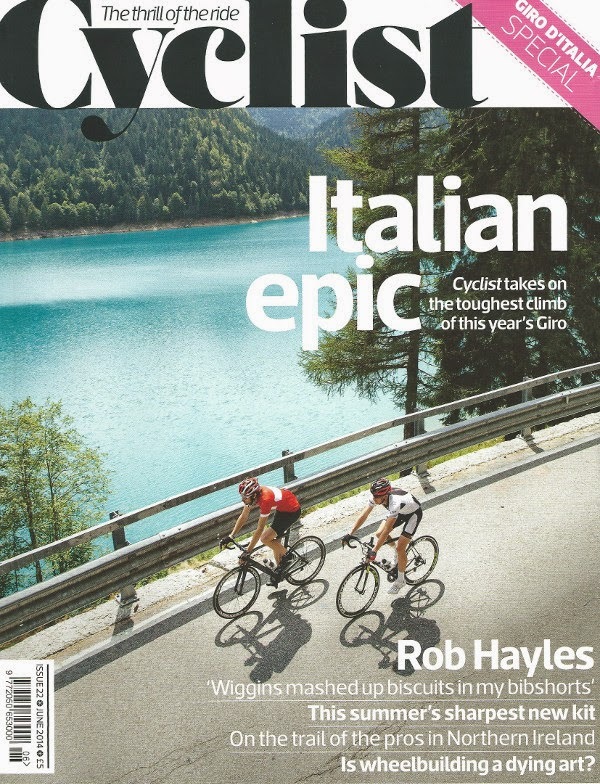 I had to suspend my cynicism and actually purchase a current cycling mag from the news stand, something I have not done for years. It was curious to see how the British cycling media reacted to the race being here, as generally Northern Ireland rarely if ever gets a mention in the normal run of things. 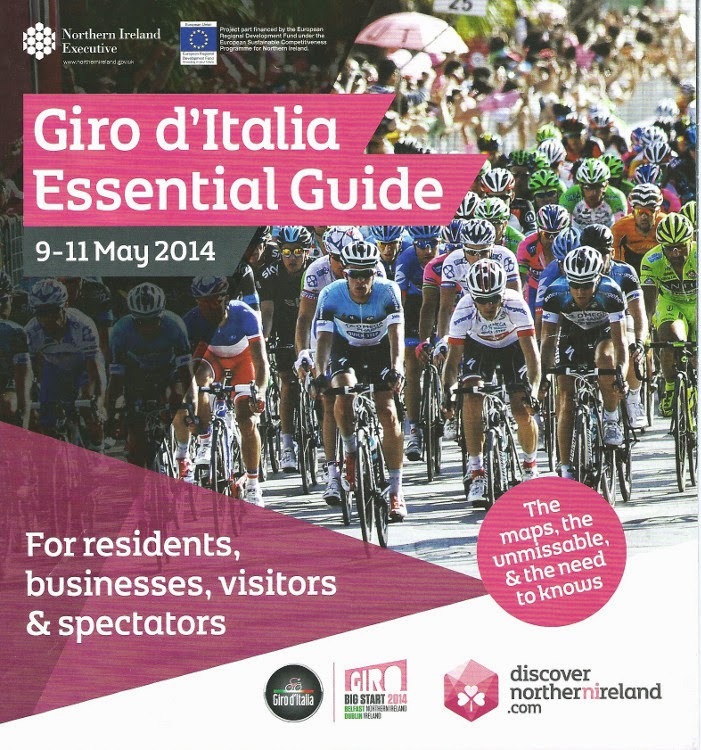 'Cyclist' magazine ran a Giro d'Italia special issue and even sent a journalist on his first ever visit to Northern Ireland to ride some of the stage 2 route. Perhaps the photographs will encourage others to come and ride the route themselves? The hosting of the race was well done by the local organizers and the Italian race promoters seemed very pleased with the engagement and support they received from the local public. The only thing that couldn't be helped was the weather, but rain is a fact of life of riding a bike here in Ireland, along with a headwind. The Giro had both! Are cycle paths necessarily a good thing?